I opened a 2005 Haiwan raw pu erh brick last weekend. This fang zhuan (aka square brick) is a very well compressed 200g brick. I managed, with a pu erh pick, to split the cake sideways into 2 slices before breaking the cake further into smaller pieces and storing the tea in a tea caddy. I had purchased 2 cakes 6 years ago and had always wanted to try brewing this tea but procrastinated till last weekend. I had previously thought that if the cake showed promise, I would buy more of this tea (inexpensive back then). But….opening this cake 6 years later meant that any repeat purchases (if the cake was good) would mean a more expensive refill and maybe some serious hunting for this tea as it is already an 11 year old tea. But I digress…talking about highly compressed pu erh….. opening compressed tea cakes especially iron cakes can be hazardous (you may accidentally poke yourself with a tea pick) and there would be lots of tea wasted as a fair amount of tea dust may be generated after breaking open such tea cakes A Xiaguan manager In Hong Kong 2 weeks back, showed me a method when he opened an iron cake. He used a plier (yes you read right). He gripped the side of a cake with a plier, and then lift up the plier, like opening the cap of a soda or beer bottle, and the result is a nice chunk of tea. This, to me is a useful tip. I believe, a larger plier can be used for opening tuos as well. Time to include a plier in your tea tool bag! Back to this tea. This tea reminded me of pinewood furniture and nice notes of fresh hay and herbs. The sweetness is extremely faint in the aftertaste and I do feel a bit sweaty after the 4th infusion. This tea brews well making 10 good strong infusions. My Haiwan distributor friend just messaged me telling me he does not have this tea. This is a simple raw but old pu erh tea. Nice. I got to drink this tea sparingly. The Hong Kong Tea Fair 2016 was held from 11-13 Aug 2016 at the Hong Kong Convention and Exhibition Centre. 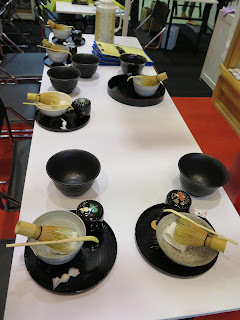 I was able to attend this tea fair and you can see some of the pictures I took while I was there. 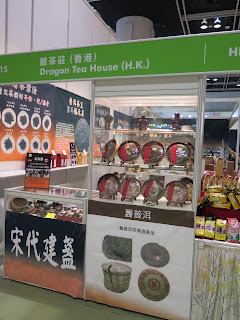 This tea fair was also held in conjunction with the Hong Kong Food Expo while drew massive visitors to look at the new food offerings from all over the world. Both the food and tea exhibitions were very well organized and professionally managed. Exhibition booklets were of high quality and given to all trade visitors. Free wifi was available and there was even a booth where you can pack and mail home commercial samples instead of lugging the goods home. The tea fair as seen in the pix was organized by country and by product. Country booths like Japan, India and China were clustered together. For the China booths, they were even sub-divided by regions like Anxi and Yunnan provinces. Tea ware distributors were also grouped together for the convenience of trade visitors. I was surprised by the quality of the Anxi Dehua ceramics and I even bought some tea ware that was for sale there (pix 6-8). I had the opportunity to converse with the Anxi tea dealers in their native ming-nan dialect and even had to opportunity to play 'interpreter' as there were several enquiries in English. And…I was rewarded with invitations to stay in their tea farms and I hope to visit Anxi next year. The Japanese tea booths were very impressive. These booths were well organized and even had a separate brochure detailing the various products and offerings of the Japanese tea dealers. There was even tables set up for visitors to learn more and try their hand in brewing Japanese tea. 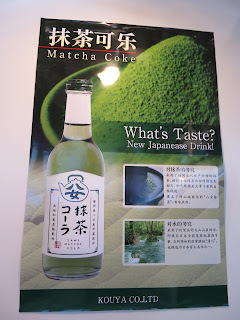 Did you notice the Matcha 'coke' in the pic? The tea fair also include presentations and talks by the tea dealers to present their tea to the trade visitors. The Australian representatives were showcasing their tea products while I was there (pix 9). A Hong Kong milk tea (kam-cha) brewing competition was also held at the tea fair, where the Hong Kong locals try to compete with each other (these guys looked real serious) brewing the popular Hong Kong milk tea. The last pix shows the tea being prepared. Notice the 'tea sock' used to brew the tea. I felt this tea fair was professionally done and I enjoyed my visit…nuff said! Grandpa tea? What is that? "Grandpa style is a term that I coined a few years ago while talking about drinking tea casually, and it has since caught on, it seems, in the blogosphere for tea. In a nutshell, grandpa style means the brewing of tea in a large cup, with no filters or teaballs or bags or anything else in it, with water constantly refilled without much regard for infusion time or temperature. The only three things necessary for grandpa style brewing are tea leaves, water, and cup, preferably a large one. I named this grandpa style, because this is how my grandfather drinks his tea, and is one of the first memory I have of people drinking tea." Grandpa style brewing was a very common sight in my part of the world as well especially from the 70s thru 90s. I recalled that, instead of large cups as mentioned by Lawrence, large teapots were used for grandpa brewing instead. Basically, a couple of spoons of tea was dropped into a porcelain teapot (see pix) and hot water is poured into the teapot filling up the teapot. When there is about a fifth of tea left in the teapot, hot water is poured into teapot again. There may be 2-4 refills of hot water in an entire day. Sometimes an extra spoon of tea is added during a refill when the tea gets weak. There are also tea baskets used to keep the tea warm. The last 2 pix show such a tea basket. I had even seen extra compartments in another basket that could store a couple of teacups as well. So how does grandpa tea taste? Any good? You can grandpa any Chinese tea but usually Liu bao, oolong and red tea were the more common teas brewed this way. As the tea leaves were allowed to 'infuse' in the hot water for a longer time, the tea does taste strong and aromatic even though the ratio of tea leaves to water seem weak compared to regular kungfu tea brewing. Grandpa tea is drank more as a thirst quencher than a tea appreciation exercise. I recently bought another cylinder porcelain teapot (see pix 1-3). About 5 inches in diameter and standing at about 6 inches tall, this teapot is decorated with gorgeous phoenix and dragon motifs. The plastic cap you see in pix 2, is a tea accessory which acts like a dust cover. This unused vintage teapot was made in the 80s/90s.